Posted September 7, 2010 by grohling & filed under BCS Oxfordshire, General Interest, Student Awards. 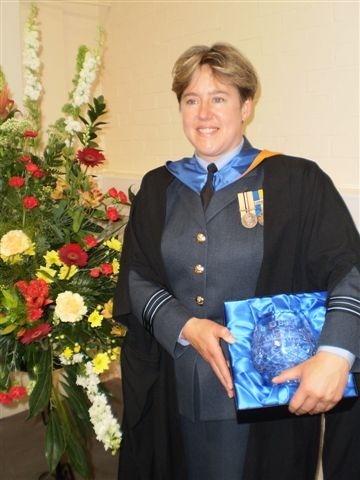 Squadron Leader Jayne Lindley was awarded the BCS Prize for Best Dissertation after recently graduating with an MSc in Information Management and Technology from Cranfield University, Faculty of Defence & Security at the Defence Academy, Shrivenham. 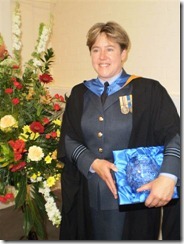 Jayne, a Royal Air Force logistics officer stationed at Headquarters Air Command in Buckinghamshire, was delighted to receive the award in recognition of her research into how strategic information systems can help small companies align resources and capabilities to better meet customer needs. "The fact that a prestigious organisation such as the BCS supports academic achievement within the Defence Academy is testimony to a positive partnership. I am thrilled with the award and I would like to convey my sincere thanks to BCS and Cranfield University staff, particularly Annie Maddison."